This species is accepted, and its native range is Tropical & S. Africa, SW. Arabian Peninsula, Comoros, Madagascar. Small to medium sized deciduous tree, up to 24 m. high; trunk usually forking a few meters from the base; bark grey to dark brown, shallow fissured; crown spreading, dome-shaped; branchlets glabrous, powdery or pubescent, sometimes hairy. 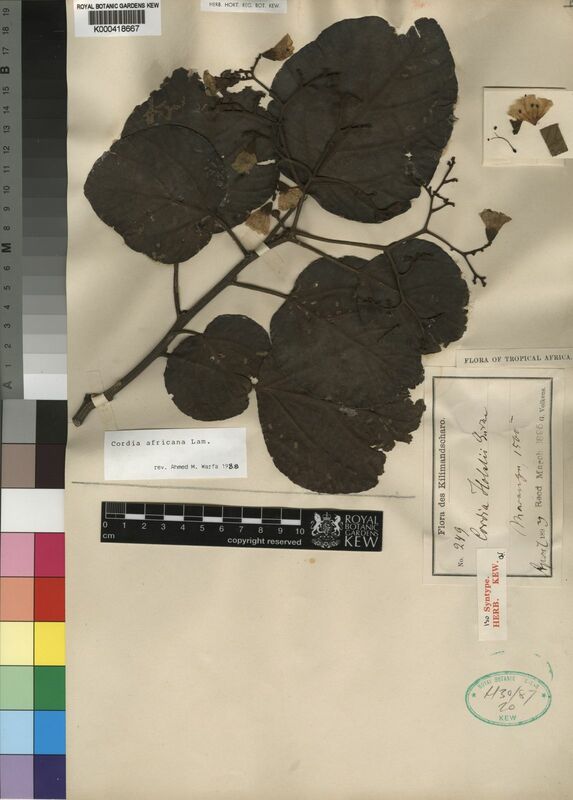 Leaves alternate or sometimes almost ternate; petiole (1.5)2.5–10.5 cm. 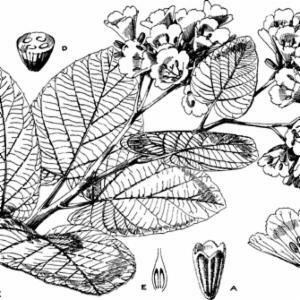 long, canaliculate, glabrous or tawny-powdery and sometimes also tawny-pubescent; lamina 6–21 x 4.0–16.5 cm., ovate or broadly ovate, sometimes subcircular or elliptic, glabrous or on the youngest leaves scabrous or minutely scaly above, powdery and often tawny-hairy on the nerves and veins below, usually rounded and suddenly shortly acuminate, sometimes acute at the apex, subacute to cordate and often asymmetrical at the base, with entire or shallowly crenate margins, usually stiffly coriaceous, with 5–7 secondary nerves on each side of the midrib, tertiary nerves perpendicular to the secondary ones, both prominent below. Cymes arranged in terminal leafy usually ample panicles; rhachis and branches tawny or brown, minutely tomentose. Flowers hermaphrodite, on pedicels up to 1 mm. long. Calyx 7–9 mm. long and 4–7 mm. wide at the mouth, tubular, with 10–12 well marked ridges, coriaceous, minutely tomentose outside, glabrous inside, opening by an operculum and later splitting into 3–5 teeth, sometimes becoming bilabiate. Corolla 17–21(24) mm. long, funnel-shaped, white; tube 15–19(22) mm. long; lobes 1.5–3.0 x 10–13(15) mm., retuse and with a pubescent mucron c. 1 mm. long, margin undulate. Stamens enclosed, inserted at 3–5 mm. from the base of the corolla; anthers 2.0–2.5 mm. long; filaments 7–10 mm. long, slender, with a few pellucid hairs at the base. Ovary c. 2.0 x 1.5 mm., ovoid, glabrous; style 13–18 mm. long, first forked at 7–12 mm. from the base, stigmatic branches c. 1.5 mm. long, more or less clavate. Fruit c. 12 x 8 mm., ovoid, ellipsoid or obovoid, apiculate, glabrous, dark brown, surrounded at base by the widened cup-shaped calyx; pyrene subquadrangular in cross section. Seeds 1–2, very rarely 3–4. Yellow succulent fruits 1/3-1/2 in. in diam. Shrub or usually a small tree to about 10 m. but occasionally much taller and attaining 18 or even 30 m.; bole usually curved or crooked, 3–8(–12) m. high; bark dark to pale brown, rough and fibrous, peeling, longitudinally fissured; inner bark white turning black; slash yellow or white turning green, grey or brownish; crown spreading, rounded or umbrella-like. Young stems brown-velvety tomentose and with longer hairs but later ± glabrous. Leaf-blades alternate, ovate, elliptic or almost round, 7.5–17.5(–30) cm. long, 3.5–9(–22.5) cm. wide, rounded to acuminate at the apex, rounded to cordate or rarely cuneate at the base, ± thick, discolorous, glabrous to scabrid above, shortly tomentellous and with longer pubescence on the raised reticulate venation beneath to very thickly velvety (‘ C. holstii ’) or eventually ± glabrous save for long hairs on the venation; petiole 1.3–13 cm. long. Flowers hermaphrodite, sweetly scented, sessile, hairy, having much the appearance of artificial flowers made of crinkly paper, massed in compact conspicuous panicles of scorpioid cymes up to 14 × 14 cm., shorter than the leaves. Calyx tubular-campanulate, (5–)7–9 mm. long, 4–6 mm. wide at the throat, conspicuously 10-ribbed, dark-brown tomentose, irregularly 4–5-toothed or sometimes ± 2-lipped. Corolla white, funnel- shaped, spreading at the apex, (1.4–)2–2.5 cm. long and about as wide; tube mostly 1.8–2.2 cm. long and lobes usually 2–3 mm. long, 1.1 cm. wide, retuse, strongly folded, crenellate, sparsely pubescent outside, the median nerves with a short hairy mucro. Stamens included; anthers blackening; filaments 8–10 mm. long. Ovary ovoid, 2–3 mm. long, 1.5–1.8 mm. wide, glabrous; style 1.2–2 cm. long, divided 0.7–1.4 cm. from the base; stigmas subulate, 1–2 mm. long. Fruits yellow, subglobose or ovoid, 1–1.2 cm. long, 6–10 mm. wide, with sweet mucilaginous flesh, glabrous, contained in the slightly accrescent cupuliform still 10-lobed calyx ± 1.1 cm. wide; endocarp subquadrangular; seeds 2–4. Figs. 5/11, 12, p. 24; 8, p. 32. Primary forest edges, secondary forest, gallery forest; also in grassland with scattered trees, Combretum, Albizia, etc. ; 450–2100 m.
K1 K2 K3 K4 K5 T1 T2 T3 T4 T5 T6 T7 U1 U2 Guinée to Ethiopia and Sudan thence to Malawi, Mozambique, Zambia, Zimbabwe, South Africa (N. Transvaal) and Angola, also in tropical Arabiacultivated in India, New Caledonia and elsewhere in tropical botanic gardens, etc. Verdcourt, B. (1991). 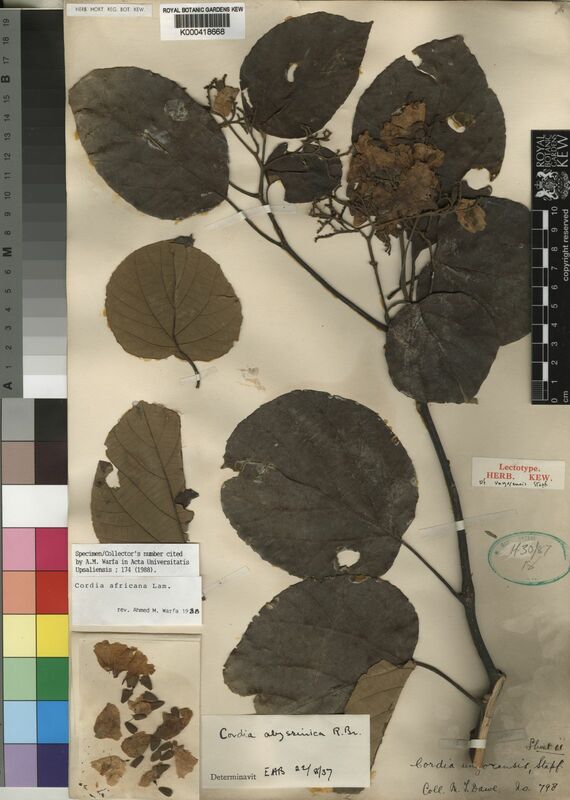 Flora of Tropical East Africa, Boraginaceae: 1-124. Launert, E. & Pope, G.V. (eds.) (1990). 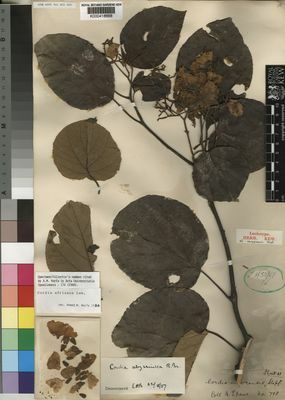 Flora Zambesiaca 7(4): 1-114. Royal Botanic Gardens, Kew. Taton, A. (1971). Flore du Congo du Rwanda et du Burundi, Boraginaceae: 1-82. Jardin Botanique National de Belgique, Bruxelles. Tabl. Encycl. Ill. 1: 420 (1792). Martins in Flora Zambesiaca 7(4): 61 (1990). Warfa in Taxon 37: 961, fig. 1 (1988). Troupin, Fl. Rwanda 3: 259, fig. 84/1 (1985). Geerling, Guide Terr. Lign. Sah. Soud.-Guin. : 83, t. 17/1 (1982). Heine in Fl. Nouv.-Caléd. 7: 106 (1976). Taton, Flore du Congo Belge, du Ruanda et du Burundi, Borag. : 4, map 1 (1971). 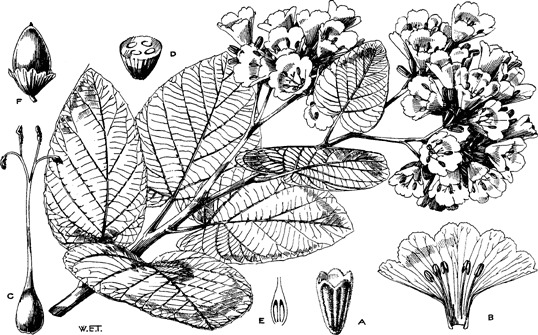 Heine in Flora of West Tropical Africa, ed. 2, 2: 320, fig. 276 (1963). Cufod., Enumeratio Plantarum Aethiopiae Spermatophyta (Supplement in Bull. Jard. Bot. Brux.) p. 766 (1961). Lam., Tab. Encycl. 1: 420 (1792).